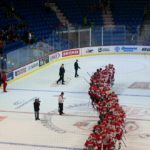 Team WHL took a late minor for high sticking against Team Russia in the CIBC International Series in a game played at the Langley Event Centre. 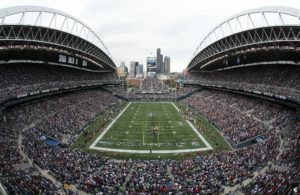 Which eventually costing them the game. 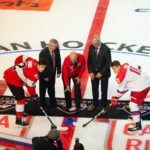 Team Russia pulled out an impressive 3-1 win in an entertaining game played in front of 4,134 fans that saw the game winner scored by Russian player Bulat Shashkov. 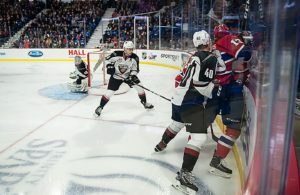 Team WHL opened the scoring five minutes in on a goal Ty Smith that saw him beat Pytor Kochetkov glove side from the top of the faceoff circle controlling the play inside their blue line. Team WHL was lead by the steady goaltending of Giants David Tendeck who for the most part had a easy opening period that saw his “D” limit shots he faced. 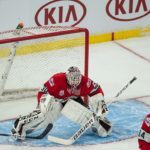 On a strange goal from a point off the shot of Evgeny Kalabushkin was deflected by Bulat Shafigullin ended in the bottom corner evening the game at 1-1 with 55 seconds left in the first. As the teams headed to the first Intermission team WHL were up in the shot department leading 18-8 after one, but saw neither team score. Tendeck was forced to come up with several key saves in the second with both teams having several PP chances but were unable to convert. The fans were entertained to exceptional penalty killing only only to have all shots turned aside that saw the second come to an end with Team Russia leading 11-9 after two. 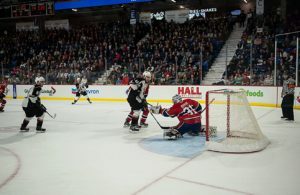 Both teams battled hard that saw Team WHL “tender” David Tendeck and Team WHL Pytor Kochetkov continue to frustrate the shooters throughout the contest. The Russians managed a late PP with Team WHL Jordy Bellerive score the game winner for the WHL last in Kamloops with 1:55 left in regulation time and it only took 15 seconds for team Russia to make them pay as Artyom Nikolaev beat Tendeck from the slot to give them a 2-1 lead. 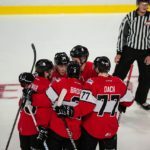 But with still under two minutes remaining team WHL pulled Tendeck for a sixth attacker only to see Team Russia add an empty netter pulling out a 3-1 victory as Ivan Muranov notched the winner, tying the series at one. Shots in the game were 34-28 for Team WHL with Tendeck stopping 31 of 33 and also being named Player of the Game. Player of the Game for Team Russia was Bulat Shafigullin, but it was Starkov that notched the game winner at 18:18 of the third. WHL Forward Justin Almeida (Moose Jaw Warriors) was injured and replaced by Dillon Hamaliuk of (Seattle Thunderbirds), wore #19 has 18 points on 8 goals and 10 assists in 13 games this season. With the addition of Dillon Hamaliuk (Seattle) there was five draft eligible players in the WHL lineup Bowen Byram (Vancouver Giants), Dylan Cozens (Lethbridge Hurricanes), Kirby Dach (Saskatoon Blades) and Nolan Foote (Kelowna Rockets). All are listed as “A” rated skaters on the NHL Central Scouting players list for Players to watch. 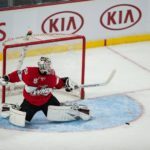 The CIBC Canada-Russia Series returned to Vancouver for the time since 2012 that saw goaltenders Laurent Brossoit (Edmonton Oil Kings) and Andrei Markov (Russia) recorded shutouts which forced a shootout and on goals by Hunter Shinkaruk (Medicine Hat Tigers), Mark McNeill (Prince Albert), and Sam Reinhart (Kootenay Ice). This game saw a 1-0 win for Team WHL in front of 11,124 fans in a game played at Vancouver’s Pacific Coliseum. 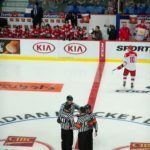 The WHL hold a 21-8-1-2 record over Team Russia in the CIBC Canada-Russia series. 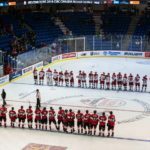 The CHL overall series between the teams now strands at 62-23-1-6.